So what’s the deal? Is it a scam? Does it always work? Is it somehow illegal? Is there some catch? When a person gets this price reduction, are they somehow paying for this by revealing private information to Facebook or something? The answers are no, it is not a scam, no, it does not always work, no, nobody is somehow making money at your expense, no, it is not somehow illegal. And no, nobody is somehow obtaining your private information. First of all let’s review the steps that a person goes through when using this GoodRX.com web site. It turns out there aren’t any steps. There is no need to “create an account”. No need to tell anybody your name or give them your email address. No need to give any identifying information at all to the web site. You do not pay anybody any money. What you do is plug in the name of the drug on the web site of GoodRX. What pops up on the screen is a list of drug store chains and the price at each of the drug store chains, with and without a discount coupon. You click on one of the drug stores, and then a coupon pops up on the screen. It displays a bunch of information (Member ID, RxGroup, RxBin, RxPCN) that would be mostly meaningless to you or me but I guess that means everything to a pharmacist. The example at right is an injectable Vitamin B12. 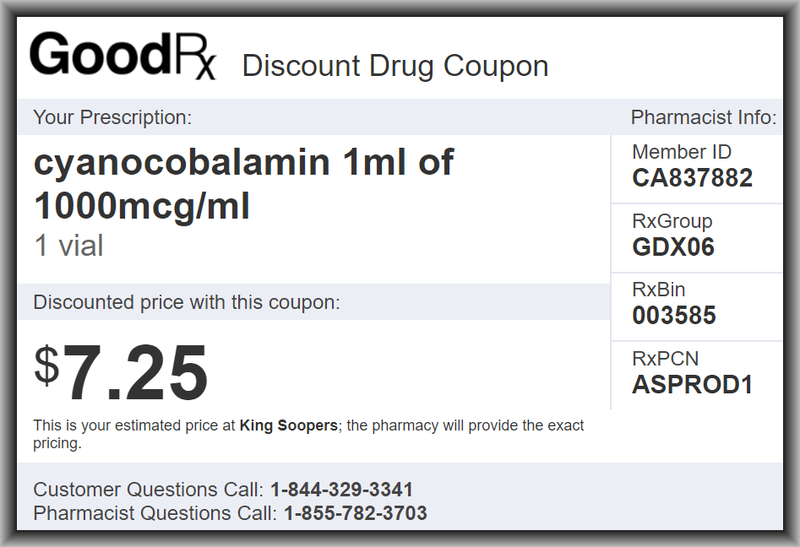 I plugged “cyanocobalamin” into the web site and this coupon popped up on the screen. I showed it to the pharmacist and the price for a vial of Vitamin B12 dropped from $18 to $7.25. The price differences can be striking, especially in cases where one’s health insurance might not cover a particular drug or might not cover it fully. An acquaintance of mine reports having gotten a prescription from his doctor for sildenafil which the alert reader will recognize as the generic equivalent of Viagra. A doctor might, for example, prescribe 20-milligram tablets with instructions to take two tablets. The acquaintance reports that the list price at CVS is about $13 per tablet, and that the GoodRX coupon brings the price down to about 63¢ per tablet. This GoodRX approach does not always save you money. Sometimes you can’t find the drug that you want on the web site of GoodRX. Sometimes the pharmacist will decline to honor the price quoted in the coupon. Sometimes you will find that your health insurance brings the price down to a cheaper price than the GoodRX coupon price. But many people find that very often, they will save money at the pharmacy by using this web site. And anyway, it does not cost any money to try. Clearly one category of consumer that might particularly benefit from GoodRX is the consumer whose health insurance has high deductibles for prescription drug coverage (or the consumer who does not have health insurance at all). Another thing to keep in mind is that when you are sitting at the doctor’s office, and the doctor asks “which pharmacy should I phone your prescription in to?”, you can bring up the drug on this web site and it will tell you the likely cost at various drug store chains. To give a random example, one commonly prescribed blood pressure drug is metoprolol. 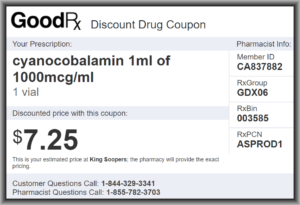 GoodRX says this will cost about $1.30 per pill at Walgreens or, with a GoodRX coupon, about 53¢ per pill at that chain. But you could instead go to CVS where, with a GoodRX coupon, the price drops to about 33¢ per pill. Finally the GoodRX web site offers the refreshing news that you could go to Walmart and without any coupon at all the list price is just 30¢ per pill. With this information you might be able to save quite a bit of money by telling your doctor to phone the prescription to one pharmacy rather than to another. Have you used GoodRX? Did it save you money? Please post a comment below. I have similarly used GoodRx to good result. Now I have my doctor give me a written prescription, so I can take it to whichever pharmacy is the cheapest on GoodRx. Another trick, especially for medicines you use for a lifetime, is to ask for a 180 day prescription. It is amazing how much that lowers the price. The medicines I take, such as allopurinol, do not get any insurance co-pay. If you go to Costco, join their “club” and tell them that this prescription is not covered by your insurance, you automatically get another significant discount. Even over the GoodRx price for Costco, which is often the lowest. Also check healthwarehouse.com. Sometimes GoodRx points to this mail order house for the best price. Easy to check their directly to see if their price beats the GoodRx prices. Getting a 180 day supply, eases the irritation of your doctor of getting a new paper scrip every time you need to refill the subscription. Usually, the best price will not be at the same place 180 days from now.